UNHCR today released more information from three Ethiopian survivors of the migrant boat that left Tripoli on 25 March with 72 passengers and which, after becoming disabled and running out of food and water, washed ashore in Libya over two weeks later with only nine survivors. “[One surviving] refugee said that military vessels twice passed their boat without stopping, and that a military helicopter dropped food and water onto the boat at some point during the journey. The first boat refused their request to board. The second only took photos, he said. The man was not able to identify where the vessels came from. UNHCR staff met with the three in Shousha camp in Tunisia. One spoke Arabic, while the others spoke Oromo. UNHCR interviewed the Arabic speaker. He said that they paid smugglers US$800 to make the journey. The passengers were expected to operate the boat on their own. According to the refugee, when water ran out people drank sea water and their own urine. They ate toothpaste. One by one people started to die. He said that they waited for a day or two before dropping the bodies into the sea. There were 20 women and two small children on board. A woman with a two-year-old boy died three days before he died. The refugee described the anguish of the boy after his mother’s death. After arrival on a beach near Zliten, between Tripoli and the Tunisian border, a woman died on the beach from exhaustion. The remaining 10 men walked to the town of Zliten where they were arrested by the Libyan police. They were taken to a hospital and then to a prison where they were given some water, milk and dates. After two days another survivor died. Bruxelles2 also notes that the time period when the migrant boat was disabled and drifting was a period when there was a shifting of commands for the multiple European and US naval and air forces operating off Libya. NATO took command of the maritime embargo on 23 March; the no fly zone and the air attacks were initially under the control of an ad hoc coalition (France, UK, USA, Canada, Belgium, Denmark); full command did not shift to NATO until 31 March and even then it took several days for the transfers of command to occur; and some military vessels continued (and continue to this day) to operate under independent national command. In short, NATO may be fully correct when it says that a vessel under its command during the time period in question did not encounter the disabled migrant boat. Further investigation into responsibility is needed. Click here for UNHCR statement. A Royal Navy mine counter-measures vessel, the HMS Brocklesby, last week located and destroyed a mine containing 100 kg of high explosives outside of the Misrata harbour. Click here for Royal Navy press statement. From Migration Policy Institute’s MPI Data Hub: annual number of asylum applications in select countries. I copied the data for years 2004-2009 below. Click here for the data for the years 1980-2009, footnotes, and source information. “1. (C/NF) Summary: The latest round of EU-Libya Framework Agreement negotiations hit snags over sensitive political issues and were slowed by Libya’s inefficient technical bureaucracy. The Libyans denounced the International Criminal Court and decreed that any language similar to the Rome Statute was off limits. Trade talks stalled when the Libyans announced that they had not examined the draft paper (presented in early 2009) and were unable to produce trade statistics from 2007/2008 or provide data on the Libyan tariff system. Talks on migration went more smoothly than expected, but significant issues remain before the agreement could be given to member states for approval. EU diplomats in Tripoli are skeptical that the EC will be able to get an agreement that can be implemented by both sides within the remaining two rounds of talks…. 2. (C/NF) Representatives of the European Commission (EC) based in Brussels conducted the latest round of Framework Agreement negotiations July 13-14 in Tripoli with sessions focused on political dialogue, trade and commerce, and migration. Diplomats from EU member states — participating as observers to the EC-Libya negotiations — said that discussions on the political framework were particularly heated. Libyan negotiator Mohammed Siala railed against language stating that the two parties agreed to discuss crimes against humanity in an international context, angrily stating that any mention of the International Criminal Court (ICC) or text similar to that of the Rome Statute would cause a total breakdown of the framework negotiations. According to the UK embassy, nothing in the political dialogue paper is binding on either party and is merely agenda-setting for future discussions. EC negotiators were not/not pushing for Libya to accede to the ICC…. Click here or here for the full Cable. Click here for a post regarding an earlier US cable discussing the state of EU-Libya framework negotiations in 2008. DIIS (Danish Institute for International Studies) is holding a seminar on 19 October: Political Asylum in the 21st Century. The seminar will be conducted by Carol Bohmer, Visiting Associate Professor at the Department of Government at Dartmouth, and Thomas Gammeltoft-Hansen, DIIS Project Researcher, external lecturer in international refugee law at the University of Copenhagen, and author of the forthcoming book entitled “Access to Asylum: International Refugee Law and the Globalisation of Migration Control” (April 2011). Description: Few issues have remained as politicized as asylum in the past few decades. Most nations recognize the moral and legal obligation to accept people fleeing from persecution, but political asylum applicants in the twenty-first century face restrictive policies and cumbersome procedures. Competing discourses of protection and control are predominant in present day asylum rhetoric. Governments need to address the conflicting needs of the state to protect their citizens from terrorists and the influx of hordes of unwelcome economic migrants, while at the same time adhering to their legal, moral and treaty obligations to provide safe haven for those fleeing persecution. Satisfying these conflicting goals at the same time may ultimately prove impossible, yet states continue to struggle to find ways to appear to meet both. How do they do it? This seminar will attempt to answer that question and illustrate the sometimes absurd effects of this process. The seminar will further compare different policy approaches, notably the cases of the United States, the United Kingdom, the European Union and Denmark. Participation is free of charge, but registration is required. Register online no later than Monday, 18 October 2010 at 12.00 noon. 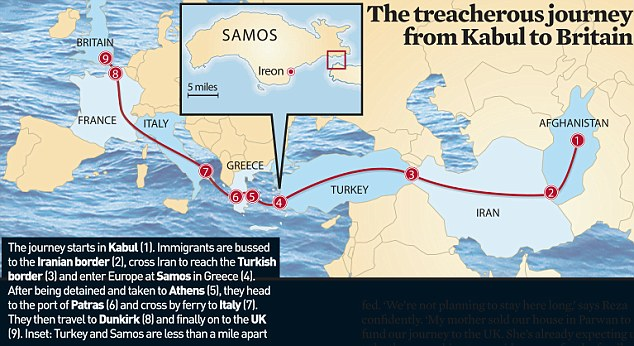 The Daily Mail has a special report detailing the experiences and routes of irregular Afghan migrants traveling from Afghanistan to the UK by way of Turkey and Greece. The Refugee Studies Centre’s International Summer School fosters dialogue between academics, practitioners and policymakers working to improve the situation of refugees and other forced migrants. It provides the time and space for them to reflect on their experiences and to think critically about some of the aims and assumptions underlying their work. Policy makers and practitioners involved with humanitarian assistance and policy making for forced migrants. Participants typically include host government officials, intergovernmental and non-governmental agency personnel engaged in planning, administering and co-ordinating assistance. Researchers specialising in the study of forced migration. Documents released under the UK’s 30 year rule (requiring many Government documents to be turned over to the National Archives after 30 years) reveal that former PM Margaret Thatcher considered the possibility of buying an Indonesian or Philippine island not only for the staging and screening of Vietnamese boat people, but also as a place of resettlement for the Vietnamese. By December 2009, the European Council will have adopted the new multiannual programme on Justice and Home Affairs, better known as the Stockholm programme. This programme will have substituted the previous Hague programme adopted on 5 November 2004, which was itself a continuation of the Tampere programme adopted in 1999. The new Stockholm programme will have been adopted under the current Swedish Presidency. For further details of the programme click here. Click here for the BBC article and link to the BBC interview. Click here for a link to the BNP website and the “BNP News” interview. Following a bi-lateral meeting, the UK and French governments have released a declaration regarding actions to be taken in regard to migrants seeking to enter the UK from the Channel and North Sea coast of France. “At European level, the French and British governments will act together to: … Strengthen the operational role of Frontex, in the spirit of the European Pact on Immigration and Asylum, especially through developing operational co-operation between Frontex and third countries, establishing joint European return flights and ensuring adequate resources. “Develop co-operation with third countries, of origin or transit, and with a specific focus on key North and West African countries, including through co-development and capacity-building measures as well as conclusion and implementation of readmission agreements, within the Global Approach to Migration that represents the European Union’s roadmap according to the European Pact on Immigration and Asylum…. Click here for full English text. Click here for the French text: Déclaration franco-britannique sur l’immigration.